Sadly the very last Harrington body to be built, No 3218, was this Grenadier C40F example on an AEC Reliance 2MU4RA chassis for Greenslades Tours of Exeter registration No FFJ 13D. 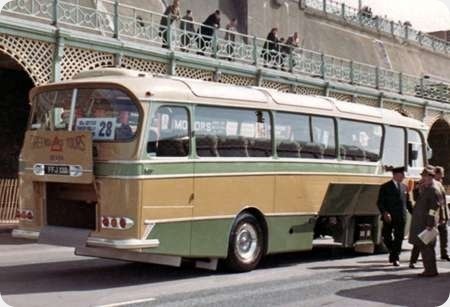 This photo was taken on the 24th April 1966 at the British Coach Rally on Madeira Drive Brighton whilst the Concours judges were making their inspection. The elegant lines of the body and the restrained but attractive livery are even 48 years later a lesson todays designers and colour stylists might well learn lessons from, but being a cynical 75 year old I doubt it will happen. This was indeed a very attractive livery, featuring an unusual shade of green. The designation 2MU4RA denotes a "crash" gearbox, which seemed a backward step after most Reliances had synchromesh gearboxes. The boot lid is interesting. I remember that Yelloway always specified two piece boot doors hinged from the sides to avoid people bumping their heads on the top hinged flaps more commonly used in the fifties and sixties. This design could be an attempt to avoid the problem. The Grenadier body was a development of the better known "Cavalier" and to me was even more attractive. I agree, Dave, it is so sad that Harrington ceased production of coach bodies, at a time when their products seemed to be more popular than ever. The parallel lift boot door was a Harrington patent device, more usually used for side lockers because of often restricted space in coach stations. It was obviously optional, as witness the side lockers on this example, and presumably cost more. I wonder why Plaxtons didn’t take over this patent? The last sentence of Diesel Dave’s caption mirrors my thoughts precisely, and I am three years even further down "Cynical Avenue" and proud of it !! Sadly, Chris, I am but a babe in arms – but a cynical nearly 62 year old! The Harrington Grenadier was the last coach body with a curved window line, a peculiarly British trend which began in the 1930s. There were plans for it to be replaced by a development of the Legionnaire if Harrington had stayed in business. As Andrew says the parallel lift mechanism was indeed a Harrington patent and some coaches I drove had a plate stating that fact. Regarding the side locker doors in a larger photo they are of the parallel lift type, I think they look as if they are hinged is because they were in the locked position which was achieved by lifting as normal and then pulling the top of the panel outward presumably to prevent accidents to fitters working underneath. Similar mechanisms can be seen on modern, but foreign, coaches although electrically powered.